Existence well what does it matter? I exist on the best terms I can. The past is now part of my future, The present is well out of hand. Joy Division, “Heart and Soul” (1980). 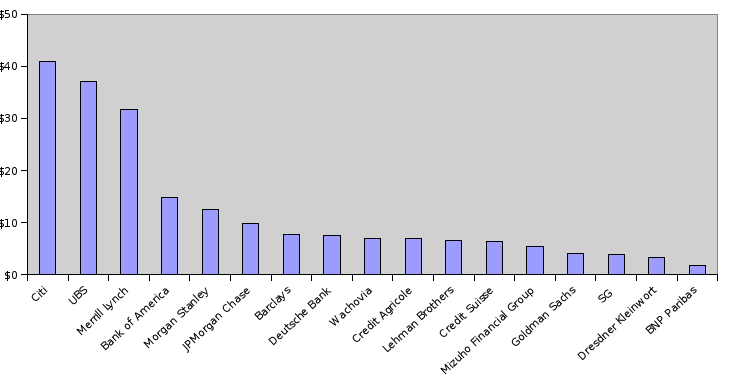 As the fallout from the subprime crisis continues, the credit losses and write downs to date of London’s big banks have been neatly compiled by Here is the City (and shown above in US$bn). On a per employee basis the three biggest losers are the Mizuho Financial Group ($2,750,000 per employee), UBS ($1,681,818), & Citi ($1,363,333) respectively. Whether firms can survive given such a poor performance is a moot point. The recently published Living Planet Index – a census of the animal kingdom, albeit based upon only 4,000 species – purports to show a dramatic and unprecedented loss in biodiversity in the period from 1970-2005 (The Independent): land species have declined by 25 per cent, marine life by 28 per cent, and freshwater species by 29 per cent. Extinction has a dynamic like financial capitalism – it is part of an evolutionary struggle, in which life today has come at the cost of the death of almost everything that came before – and both species (literally) and bankers (figuratively) live and die seeking a balance or compromise between growth and stability. Public concern about the fate of the planet suffers from overkill. Many who once cared about the environment now share a Voltairean sentiment that the easiest way out of the crisis might be to strangle the last panda with the guts of the last blue whale. However, today’s cataclysm is no different from many others… Few plants and animals live for long. The descendants of a very few, transformed by natural selection, make up the world today. Steve Jones, “Almost Like a Whale. The Origin of Species Updated” (1999). But whilst the world is basically full — new species will have to push out their predecessors — human action since the advent of industrial revolution has had a profound impact. [And sometimes we create unexpected niches for a wildlife renaissance – the Iron Curtain becomes a biological corridor or green belt across Europe]. We are essentially shoving many species into a situation whereby there are too few individuals to avoid utter extinction. Governments are now intervening in financial markets – to protect the public from the banks’ excesses (and to save the banks themselves from the excesses of global financial markets). Regulation has proven insufficient (it tends to focus like generals on the last battles) and the rewards from financial globalisation of the past 5-10 years seem too slim given the costs: the challenge is to improve regulation, but its effectiveness will be will only be shown by the next financial cycle. The convalescence of the banks has begun, but the recovery from a slowdown in consumption and economic growth will take a while. Biodiversity loss has also been asymmetric – and the policy response has been vapid. Can anything effective be done? Prince Charles has called for a fund of US$15bn a year to pay for a “global insurance policy” to halt deforestation. Such a global commitment would be a fillip: but getting the incentives right (plus concomitant transparency and accountability in carbon markets) for avoided deforestation is more of a challenge than finding the cash.